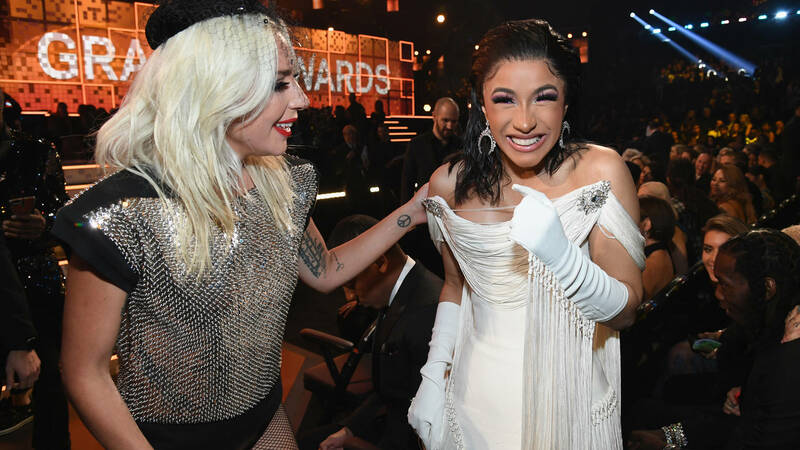 Home>Music> Cardi B Gets Glowing Endorsement From Lady Gaga: "She Is Brave"
Upon receiving the Grammy Award for "Best Rap Album," Cardi B appeared ecstatic and honored in equal measure. Yet in the subsequent hours, the Invasion Of Privacy rapper found herself hit with an onslaught of reckless hate. The nonstop nature of the ruthless disgust, vitriol, and general unpleasantries proved too much to bear for Cardi, who deleted her Instagram page in a retaliatory gesture. In truth, a vacation from social media never hurts, especially for someone as popular as Cardi. Now, in the wake of her departure, many artists have come to her defense with messages of support. Lady Gaga, herself no stranger to the industry's machinations and pitfalls, took to Twitter to defend Cardi's honor. "It is so hard to be a woman in this industry. What it takes, how hard we work through the disrespectful challenges, just to make art," she writes. "I love you Cardi. You deserve your awards. Let’s celebrate her fight. Lift her up & honor her. She is brave." As of now, Cardi has yet to respond. Still, it's great to see Lady Gaga come through with the clutch leadership, especially after everything she's accomplished during her tenure in the game. By month's end, she may very well be a bonafide Oscar winner. MUSIC Cardi B Gets Glowing Endorsement From Lady Gaga: "She Is Brave"